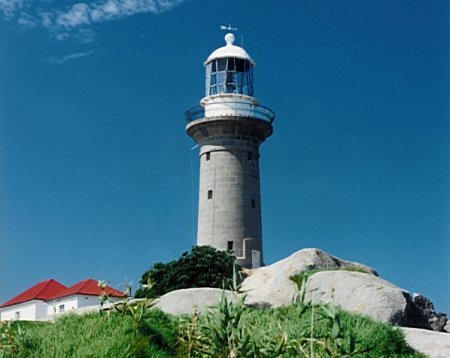 Montague Island Lighthouse | Lighthouses of Australia Inc.
Montague Island was originally a fertile hunting ground for the local Aboriginal people. Since 1881, European visitors have landed here to inspect the Island’s renowned granite lighthouse and enjoy a tour of this scenic area which boasts colonies of seals and fairy penguins. or Montague Island as it is now known, was a fertile hunting ground for the Aboriginal people of the Walbanga and Djiringanj tribes. Sea-bird eggs, muttonbird and penguins for example could be gathered there in abundance and archaeological sites on the island indicate that the area was an important resource for the local aborigines. Access to the island though was not without its dangers. Legend has it that an estimated 150 Aboriginal people were drowned in the early 1800s when their bark canoes where swamped in a squall which blew up during their return from Barunguba. The building of the lighthouse was first advocated in 1873. Construction of the lighthouse, designed by James Barnet, commenced in 1878. 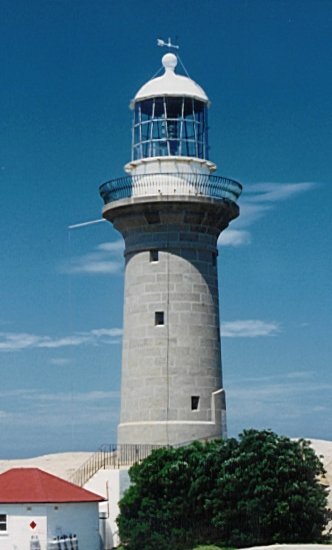 Barnet was responsible for at least 15 major lightstations along the coast of New South Wales in this era. 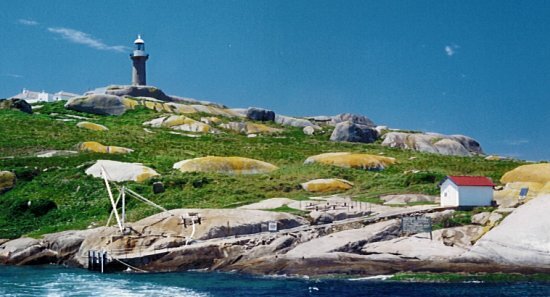 The original contractor went against instructions and damaged the large granite boulder selected for the lighthouse base with unauthorised blasting. As a result the lighthouse was repositioned by several feet. Due to continued tardiness and difficulties the contractor eventual gave up the contract and in 1880 a new tender given to a second contractor. By then a temporary light set up earlier had been in operation about a year. Since 1881, visitors have landed here to inspect the Island’s renowned lighthouse and enjoy a tour of this scenic area which boasts colonies of seals and fairy penguins. During the keepers’ era, all household and lighthouse stores had to be brought in by sea. The supplies were then brought up from the jetty to the lighthouse complex via a tramway. The tower is constructed of locally hewn interlocking granite blocks which were quarried on the island. It is fitted with a bronze handrail. In 1910 the light was upgraded to 250,000 CD and upgraded again in 1923 to 357,000 candlepower. In 1969 the power was raised to 1,000,000 CD with the conversion to electricity supplied by a diesel generator. 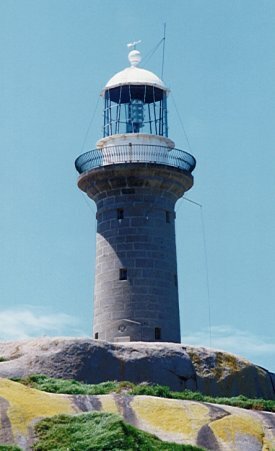 In September 1986, the old light was turned on manually for the last time by keeper John Short. As part of preparation for demanning, the original apparatus, including the lens was removed and replaced by a lightweight array of sealed beams. The power was reduced to 120,000 CD but it could easily be powered by an unattended array of solar panels. 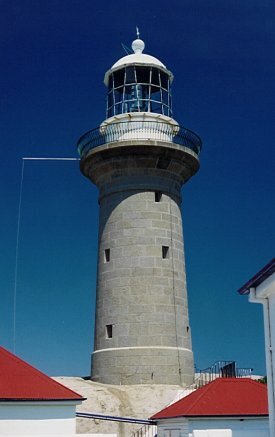 When removed, the old lens and lantern was erected in the Museum at Narooma which is now displayed in a short 5 metre tower. A coin-operated mechanism operates on a slot coin principle. This switches on the light, the lens rotation and the operation of the original beam from the lens. The whole township of Narooma participated in the expenses concerned. The remaining keepers were either transferred to the National Parks and Wildlife Service or taken off the Island in December 1987. COTTEE, William Henry ?? 1942 - ? On this bare landscape is a small cemetery. Some of the residents died under particularly tragic circumstances. An assistant keeper, Charles Townsend, was killed when a horse bolted. 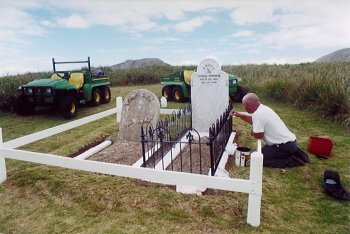 There are two children, John and Isabella Burgess, who died of suspected meningitis in the late 1880s because rough seas prevented them from being taken to the mainland for treatment. Steamers coming from the south ignored pleas for help because it was so difficult to land on the island. 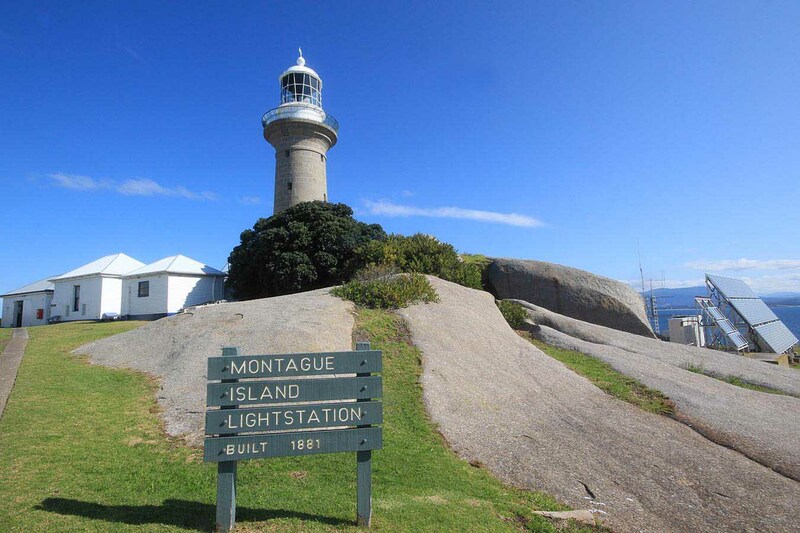 The station is located on Montague Island, 12 km offshore to the east of Narooma. The Island is a Nature Reserve managed by the NSW National Parks & Wildlife Service. Since it was first declared a wildlife sanctuary in 1953, access to Montague Island has been restricted. Tours of the area’s historic buildings are however organised on a regular basis by the National Parks and Wildlife Service. Further information on these tours is available from either the Narooma Visitor Centre or from the Narooma National Parks and Wildlife Service Office. Stay in the Assistant Lighthouse keepers cottage or why not be Head Lighthouse Keeper and stay in the Head Keepers cottage. The original lens apparatus onshore, installed in a 5 metre tower at the Narooma Lighthouse Museum attached to the Visitors Centre in the main street of Narooma. There are also many other artifacts and history displays of the lighthouse.